The conductors of an overhead transmission or distribution lines are secured to the supporting structures by means of insulating fixtures in order that there is no current leakage to the earth through the supports. Thus the insulators play an important part in the successful operation of overhead transmission or distribution lines. High mechanical strength to withstand the load because of conductor weight. High relative permetivity to give high dielectric strength. High ratio of puncture strength to the flash over voltage. There should be no effect of change in temperature. Must be free from internal impurities and cracks. Should be impervious to the fluids and gases in the atmosphere. The material most commonly used for insulators is porcelain, but glass, steatite and special composition materials are also used to a limited extent. Now a days it is used extensively for the manufacture of insulators. It is produced by firing a mixture of quartz, Kaolin and feldspar at a high temperature. It is mechanically stronger than glass. Its surface is not affected by dirt deposits and withstands temperature changes. It has dielectric strength of about 60 kv/cm and a compressive strength of 7000 kg/cm2. It is used upto 33 kv. Glass is cheaper than porcelain in simpler shapes. Dielectric strength of about 140 kv/cm. It has higher compressive strength than porcelain. Its coefficient of thermal expansion is less. It is used upto 25 kv under ordinary atmospheric conditions and upto 50 kv in dry atmosphere. Steatite is a naturally occuring magnesium silicate usually found combined with oxides in varying proportions. It has a much higher tensile and bending stress than porcelain. These insulators are used at tension towers or when transmission line takes sharp turn. The special artificial material is used in insulators for low voltages and have an important advantage that these can be easily moulded into any shape without any internal stress. 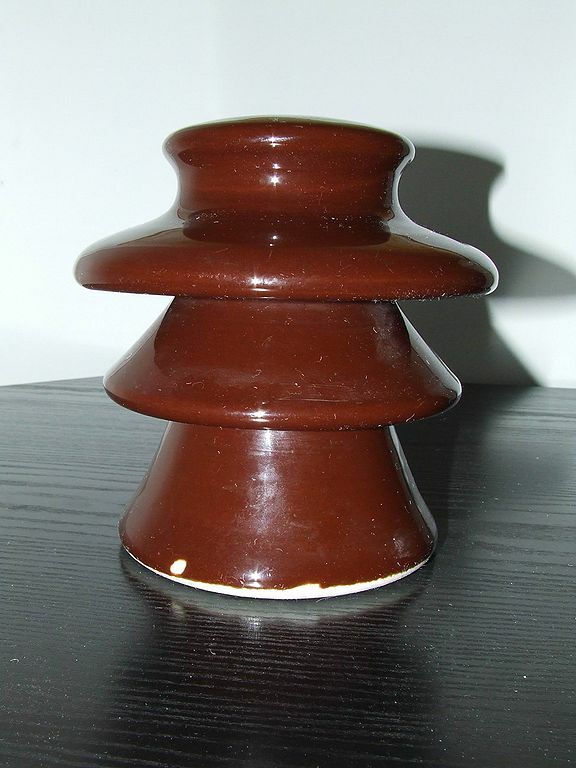 Various types of insulators are briefly described below. They are used in the design of overhead transmission lines. The pin type insulator is designed to be mounted on a pin which in turn is installed on the cross-arm of the pole. For lower voltages generally one piece type of insulators is used. For high voltage transmission lines larger, stronger pin type insulators are used. The high voltage pin type insulators differ in construction from low voltage type in that they consist of two or three pieces of porcelain cemented together. These pieces form petticoats. These are designed to shed rain and sleet easily. These are available for use upto 50,000 volts. Insulators are required to withstand both mechanical and electrical stresses. The latter type is primarily due to line voltage and may the breakdown of the insulator. The electrical breakdown of the insulator can occur either by flash-over or puncture. The ratio of puncture strength to flash over voltage is known as safety factor. The main advantage of pin type of insulators is that they are cheap. in many cases one pin insulator can do the work of two suspension insulators. Secondly, pin insulator requires a shorter pole to give the same conductor clearance above the ground since pin insulator raises the conductor above the cross-arm while the suspension insulator suspends it below cross-arm. However, its use beyond operating voltage of 80,000 volts become uneconomical. The modern practice is not to use pin type insulators beyond 33000 volts. Insulators of this type are used on intermediate poles on straight runs. These do not take tension. With the increase in operating voltage, the insulation required increases. Transmission lines use extremely high voltages, 22kv for example. At these voltages, pin type insulators become bulky, cumbersome and costly. In order to meet the problem of insulators for these high voltages, the suspension insulator was developed. The suspension insulator hangs from the cross-arm, as opposed to the pin insulator which sits on the top of it. The line conductor is attached to its lower end. Because there is no pin problem, we can put any distance between the suspension insulator and the conductor just by adding more insulators to the "string". The entire unit of suspension insulators is called a string. How many insulators the string consists of depends upon the working voltage, the weather conditions, the type of transmission construction, and the size of insulator used. It is worthnoting that in a string of suspension insulators one or more insulators can be repelled without replacing the whole string. Suspension type insulators are cheaper than pin type insulators for voltages beyond 33 kv. If any one disc is damaged, the whole string does not become useless because the damaged disc can be replaced by the sound one. The suspension arrangement provides greater flexibility to the line. 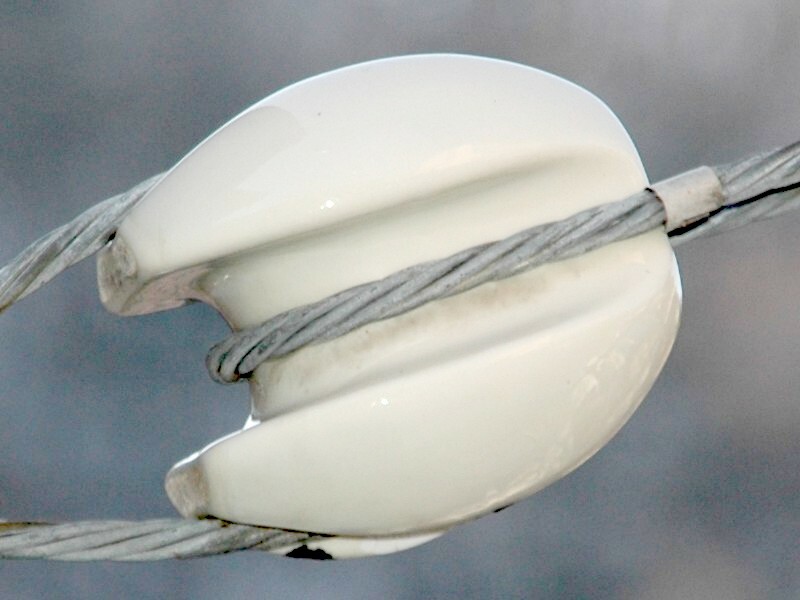 The connection at the cross arm is such that insulator string is free to swing in any direction and can take up the position where mechanical stresses are minimum. In case of increases demand on the transmission line, it is found more satisfactory to supply the greater demand by raising the line voltage than to provide another set of conductors. The additional insulation required for the raised voltage can be easily obtained in the suspension arrangement by adding the desired number of discs. The suspension type insulators are generally used with steel towers. As the conductors run below the earthed cross-arm of the lower, therefore, this arrangement provides partial protection from lightning. Sometimes a line is to withstand great strain, for instance at a dead end or at a corner or on sharp turns. In such a circumstance for LT (low tension) lines shackle insulators are used but for HT high tension transmission lines strain insulators consisting of an assembly of suspension type insulators are used. Because of its peculiarly important job, a strain insulator must have considerable strength as well as the necessary electrical properties. Two or more strings of suspension insulators are used in parallel when the tension is exceedingly high. The discs of strain insulators are employed in a vertical plane where as the suspension insulators are used in horizontal plane. Shackle insulators are also known as spool insulator, which is easily identified by its shape, is usually used on lt lines. Both the low voltage conductors and the house service wires are attached to the shackle insulator. 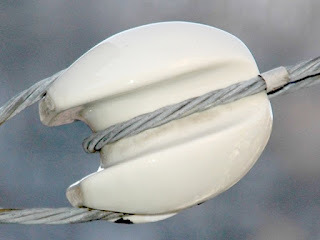 These insulators are of egg shape and used in guy cables, where it is necessary to insulate the lower part of the guy cable from the pole to the safety of the people on ground. These are provided at a height of about 3 m from the ground level.